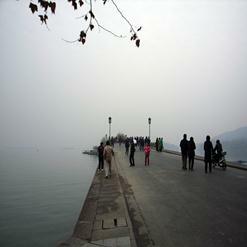 Wushan Square and Wushan Hill are a major town center in Hangzhou. The view from the top is excellent on a clear day, and there are also trails around the hills from behind the pagoda. The pagoda itself has been modernized with an elevator and nice open-air teahouse at the top, but the original bell is still intact and in use.